Haifa, Israel, March 8, 2007 – Elbit Systems Ltd. (NASDAQ: ESLT) introduces in AUSA Winter Symposium and Exhibition the VIPeR™- a Versatile, Intelligent, Portable Robot and the newest member of its unmanned systems family. VIPeR™ is a small, lightweight, one-person portable robot capable of climbing stairs and obstacles to carry out a variety of missions, saving soldiers lives and enabling more effective combat performance. Designed to reduce the danger to the dismounted force during different phases of combat, VIPeR™ can take on many of the challenges faced by today's land warriors. Portable and highly mobile, it is configurable for multiple types of missions by add-on sensors, modules and payloads, tailored to specific tasks. The compact system measures 18"L x 18"W x 9"H and weighs 25 lbs. The intelligent, small-signature VIPeR™ can also be configured with weapons capability. The system is remotely controlled via a control harness and helmet mounted display. Optional payloads include: P&T, FLIR, observation day/night zoom camera, explosives sniffer, disrupter, 9 mm mini-Uzi with scope and pointer, grenade releaser, 4-foot robotic arm, gripper, in-building mapping and more. Always alert and undeterred by stairs, rubble, dark alleys, caves or narrow tunnels, VIPeR™ is a highly effective partner for dismounted soldiers, keeping them out of harm's way by detecting IEDs and booby traps and warning them of enemies and dangers ahead. 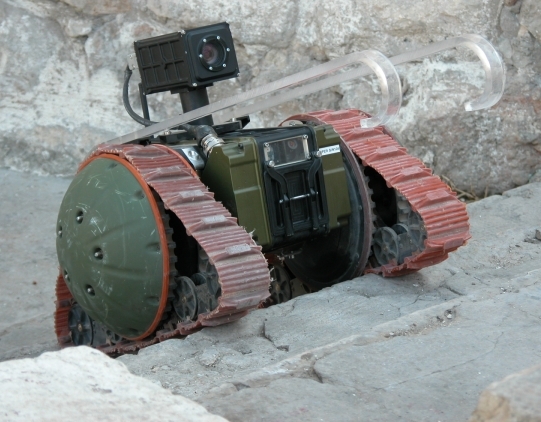 VIPeR™ was developed for the Israel Defense Forces (IDF) within the framework of its Portable Unmanned Ground Vehicle (PUGV) program, and in close cooperation with The Israeli Ministry of Defense’s Directorate of Defense R&D (DDR&D). Following operational evaluation, the IDF plans on fielding VIPeR™ in its infantry platoons. With its diverse UAV product line ranging from the Skylark mini-man-packed UAV to the Hermes long endurance systems, Elbit Systems unmanned air vehicles are playing crucial roles in intelligence gathering and are primary elements in net-centric warfare worldwide. In the realm of Unmanned Ground Vehicles (UGVs), "AvantGuard", a fully autonomous Unmanned Ground Vehicle (UGV) system, can perform semi-autonomous defense and security missions and carry various payloads depending on the nature of mission to be performed. Commanded from the HQ and equipped with a multi-layered sensor suite and "behavioral" software that automatically detects and avoids obstacles, "AvantGuard" is well suited for autonomous Border Patrol. Stingray - is an advanced surface Unmanned Sea Vehicle (USV) system. Stingray can navigate and cruise autonomously and is operated from a Command and Control Station that can be located either on shore or onboard a ship. The ruggedized USV features GPS navigation and positioning, two watertight, sealed compartments and electro-optical stabilized payloads. Stingray's advanced capabilities make it an effective solution for numerous applications including Coast Guard and littoral waters Intelligence, Surveillance, Target Acquisition and Reconnaissance (ISTAR) missions.